I love Halloween, always have. When I supervised a small group of social workers, I used to force them all to dress up against their will. One year I made all the costumes for the Wizard of Oz and even had our 6 foot tall maintenance man dress up as Dorothy. I decided to set the mood for October, I would try and post a different Halloween design every day. 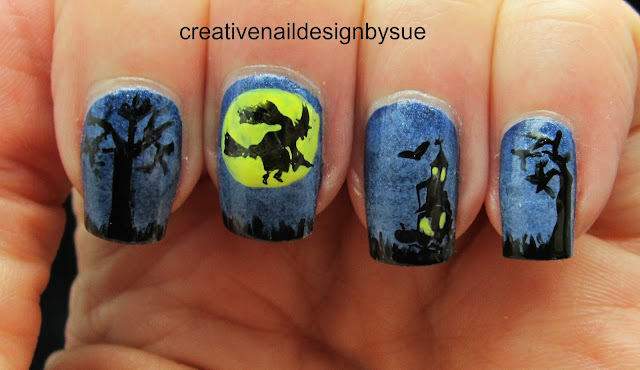 Some nights I have more time than others so I will be doing a combination of nail art, stamping and Indie Halloween polishes. All of my favorite things. First up is some nail art. Believe it or not, the hardest part here was getting the background just the right color. It is Cult Nails Time Traveler with Essie Lilacism sponged over the top. The moon is Orly Spark and all the black is done with Konad black either free hand or stamped. I don't have my stamping stuff nearby so I can't give you plate numbers but ask if you feel you must know. No one loves Halloween like Ruby does. She's been obsession for 2 weeks already and we have a month to go. help! WOW that's amazing! Lovely work! Fabulous! I love all of the detailing!! oh my gosh, Sue, this is OUTSTANDING!!!! Hardly ever one comes across such well executed manicure!!! awesome, awesome job!!! This is totally amazing!! I love it! Your Halloween manicure is stunning, love how you made the base color.Your very creative and skilled! You always have to best manis!!! were you inspired by a specific illustration or is that original? I had a stamp of a witch flying on a broomstick (I didn't freehand that) so I googled flying witches and found dozens of images of flying witches in various settings. So I joined together pieces of various photos to make a scene. It was for a bundle monster Halloween stamping contest so I tried to use as much stamping as I could. 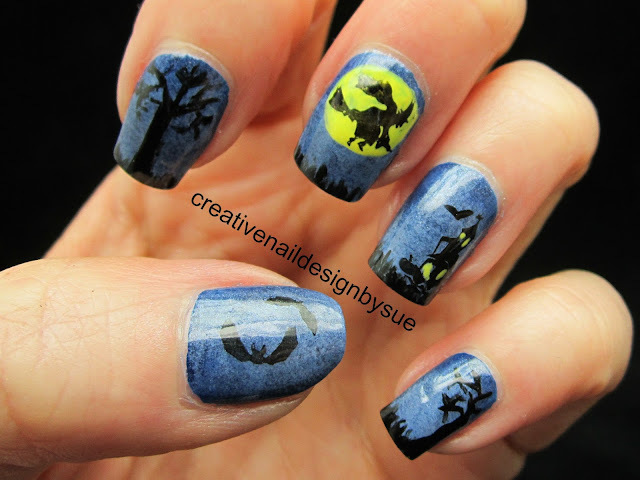 The house and bats were also stamps and the trees I had to freehand because I didn't have a stamp for those.